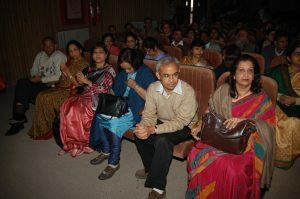 The 9th Delhi College lecture was held at Zakir Husain Delhi College in the Salman Ghani Hashmi auditorium on 18th January, 2016. The lecture was delivered by Janab Gulzar Dehlvi,(Pandit Anand Mohan Zutshi) eminent urdu poet and champion of the Urdu language. He spoke on Dehli kitaree khaur Tahzeeb. On this occasion Janab Dehlvi released two books authored by Dr. Mumtaz Fukrun and DrJameel-ur Rehman and Dr. Jamshed Khan. This lecture series is a celebration of the composite culture of the college which bears the distinction of being the oldest institution of the University. Famous historian, author, journalist and a prominent figure in the city of Delhi, Mr. R. V. Smith delivered the 8th Delhi College Memorial Lecture, “The Lingering Charm of Delhi”, at Zakir Husain Delhi College on 5th November 2014. 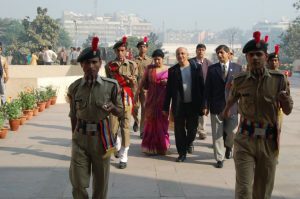 The lecture was interspersed with his nostalgia for Delhi’s rich cultural past and described his profound experiences. Mr. R. V. Smith spoke about Ghalib, the monuments of Delhi, the old majestic houses of Old Delhi and the famous shops and eateries of the area like the Karim’s Hotel, Haveli HaiderQuli, providing interesting, and often unheard of, anecdotal accounts of the same. For instance, he spoke of the Bengali Market as being named after Bengali Mal Lohia, and not as something that was a result of the Bengali community settling in.